If adopted, Bill 21 would prevent public employees — including teachers, police officers and judges — from wearing religious symbols at work. Montrealers took to the streets to protest Quebec's proposed religious neutrality bill at two separate rallies on Sunday, in Côte Saint-Luc and in downtown Montreal. Several hundred people gathered in front of the Bernard Lang Civic Centre on Cavendish Boulevard Sunday morning for a protest organized by the City of Côte Saint-Luc. They were joined by a coalition of mayors, city councillors, school board commissioners and representatives from provincial and federal governments. Anthony Housefather, the Liberal MP for Mount-Royal, said he came to the rally because the proposed law would deny the rights of some of the citizens he represents. 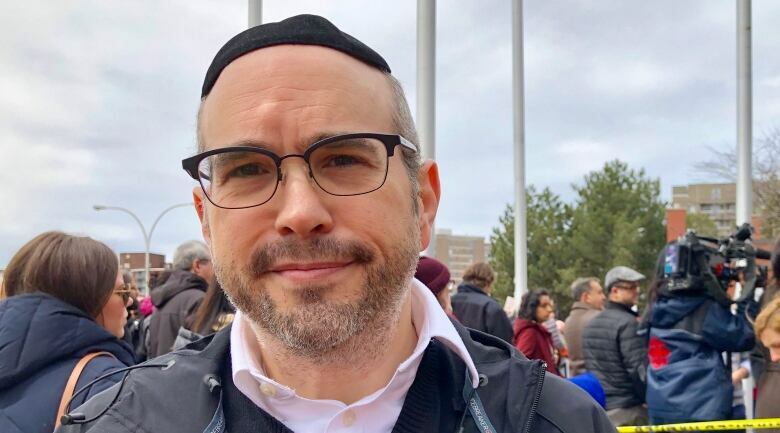 "I have residents that elected me that wear hijab, a kippa, a turban, and their rights would be violated," he said. "They wouldn't be allowed to apply for certain jobs or hold certain jobs in society. It's just not right." Housefather said the conversation is fundamentally about rights. "The issue, when you have a Charter of Rights, is not whether a majority supports a law. It's a question of whether some people's rights are being violated," he said. "We've chosen to live in a society where a majority doesn't always rule, that there are some rights that are so fundamental that you have to protect them." Lionel Perez, the leader of Montreal's official municipal opposition, said he feels the bill doesn't represent Quebec values. "We don't see ourselves in this law. We should not be legislating discrimination," Perez said. Perez wears a kippa, and says he likes to think of himself as an example of "what the new Quebec is all about." "I'm an elected official. I represent everybody from all walks of life," Perez said. "[My faith] hasn't violated my ability to represent them impartially." Also on Sunday, religious and social justice organizations gathered for a demonstration organized by the Canadian Muslim Alliance at Place Émilie-Gamelin. "All Quebecers of conscience are encouraged to attend and stand in solidarity with those who will be directly affected by Bill 21, if it's implemented," the Facebook event says. Representatives from the Catholic and Anglican dioceses, Montreal's board of Rabbis, the United Church of Canada and the World Sikh Organization of Canada are also expected to attend. 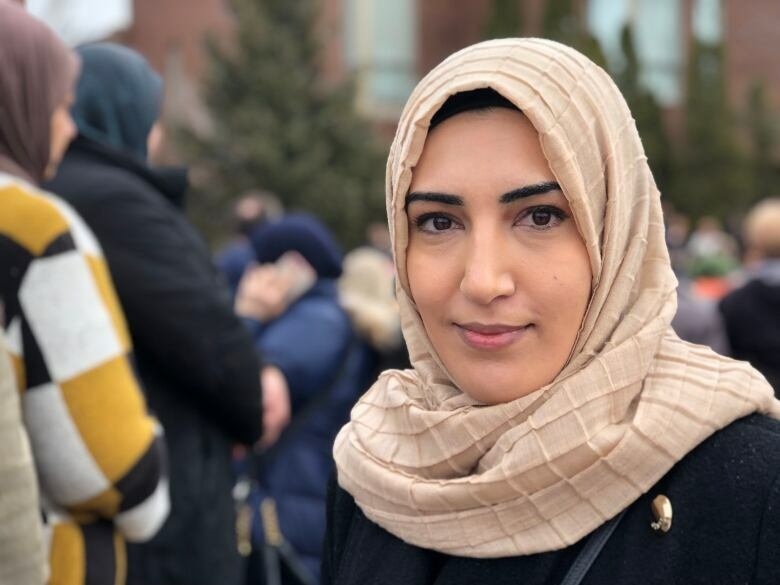 Maryam Raza, a Muslim engineer from Côte Saint-Luc, wears a hijab. She says she's protesting because the bill targets specific people who are already well-integrated into Quebec society. "In Quebec, especially in Montreal, it's such a diverse city. We should be concentrating on other problems other than religious symbols," Raza said. Premier François Legault said Sunday that he feels Bill 21 represents a reasonable compromise, since nothing will stop public employees from wearing religious symbols in their private lives. "People will have the right to wear a religious sign in the street. They will have the right to wear a religious sign for the vast majority of jobs in Quebec," he said.